Ratio analysis and EPS are used to compare the strengths and weaknesses of various companies with industry or company benchmarks. Financial analysts use financial ratios to compare the strengths and weaknesses in various companies. 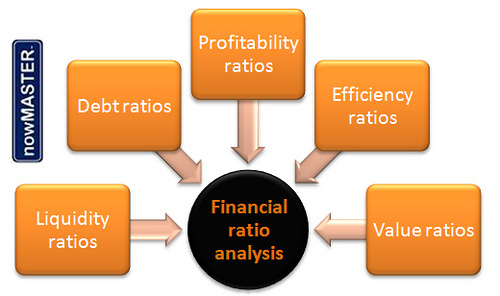 Financial ratios quantify many aspects of a business and are an integral part of the financial statement analysis. Financial ratios are categorized according to the financial aspect of the business which the ratio measures. Earnings per share (EPS) is the amount of earnings per each outstanding share of a company’s stock. Financial Accounting Standards Board (FASB): The Financial Accounting Standards Board (FASB) is a private, not-for-profit organization whose primary purpose is to develop generally accepted accounting principles (GAAP) within the United States in the public’s interest. Preferred dividends: Preferred stock usually carries no voting rights, but may carry a dividend and may have priority over common stock in the payment of dividends and upon liquidation. Diluted EPS: Diluted Earnings Per Share (diluted EPS) is a company’s earnings per share (EPS) calculated using fully diluted shares outstanding (i.e. including the impact of stock option grants and convertible bonds). A financial ratio (or accounting ratio) is a relative magnitude of two selected numerical values taken from an enterprise’s financial statements. Often used in accounting, there are many standard ratios used to try to evaluate the overall financial condition of a corporation or other organization. Financial ratios may be used by managers within a firm, by current and potential shareholders (owners) of a firm, and by a firm’s creditors. Financial analysts use financial ratios to compare the strengths and weaknesses in various companies. If shares in a company are traded in a financial market, the market price of the shares is used in certain financial ratios. Values used in calculating financial ratios are taken from the balance sheet, income statement, statement of cash flows or (sometimes) the statement of retained earnings. These comprise the firm’s “accounting statements” or financial statements. The statements’ data is based on the accounting method and accounting standards used by the organization. Activity ratios measure how quickly a firm converts non-cash assets to cash assets. Debt ratios measure the firm’s ability to repay long-term debt. Profitability ratios measure the firm’s use of its assets and control of its expenses to generate an acceptable rate of return. Market ratios measure investor response to owning a company’s stock and also the cost of issuing stock. These are concerned with the return on investment for shareholders, and with the relationship between return and the value of an investment in company’s shares. Ratios generally are not useful unless they are benchmarked against something else, like past performance or another company. Thus, the ratios of firms in different industries, which face different risks, capital requirements, and competition are usually hard to compare. Earnings per share (EPS) is the amount of earnings per each outstanding share of a company’s stock. In the United States, the Financial Accounting Standards Board (FASB) requires companies’ income statements to report EPS for each of the major categories of the income statement: continuing operations, discontinued operations, extraordinary items, and net income. The EPS formula does not include preferred dividends for categories outside of continued operations and net income. Earnings per share for continuing operations and net income are more complicated in that any preferred dividends are removed from net income before calculating EPS. This is because preferred stock rights have precedence over common stock. Since actual business activities are planned in relation to forecasting, it is very important that realistic expectations and estimations be undertaken. Business planning and forecasting refers to the set of activities where business operations are planned against the business strategy. Forecasting financial statements comprises the estimation of several values – including sales, costs, and expected interest rates. It is always easier to forecast future performance of a business if your business is already up and running because there are past trading results to look at. Forecasting can be used in Supply Chain Management to make sure that the right product is at the right place at the right time. On a broader level, economic forecasting is the process of making predictions about the economy as a whole. inflation: In economics, inflation is a rise in the general level of prices of goods and services in an economy over a period of time. supply chain management: Supply chain management (SCM) is the management of a network of interconnected businesses involved in the provision of product and service packages required by the end customers in a supply chain. Egain Forecasting: a method of controlling building heating by calculating demand for heating energy that should be supplied to the building in each time unit. Business planning and forecasting refers to the set of activities where business operations are planned against the business strategy, and what forecast activities or results may occur from operational execution during a particular time period. In preparing financial forecasts, firms should always assume they will be reviewed by a bank manager, regulatory agency, or investor. With this goal in mind, the firm should be guided to keep forecasts tidy and easy to understand by grouping cash inflows and outflows in simple ways that are easy to understand quickly. Forecasting financial statements comprises the estimation of several values – including sales, costs, and expected interest rates. Since actual business activities are planned in relation to these estimations, it is very important that realistic expectations and estimations be undertaken. With this in mind, there are specific points of interest to lenders and investors that need to be addressed. The profitability of a business reflects a sound relationship between market-driven sales projections and accurate cost estimates. Have you planned to have sufficient cash to meet your regular bills and also non-regular costs (like annual insurance premiums)? Does the financial position of the business remain sound when growth is forecast (this is what the balance sheet is for)? Is there a sensible balance between borrowings and the amount contributed by the owner (when the business is raising capital in its own right)? Are short and long-term obligations matched with relevant finance options? Do key business ratios remain within sensible bounds? It is always easier to forecast future performance of a business when the business is already up and running because there are past trading results to look at. When a completely new venture is being planned a certain amount of imagination and estimation is required. However, this is in no way a license to be overly optimistic. Forecasting has applications in many situations and impacts multiple aspects of a business. One such aspect is Supply Chain Management. Forecasting can be used in Supply Chain Management to make sure that the right product is at the right place at the right time. Accurate forecasting will help retailers reduce excess inventory and therefore increase the profit margin. Accurate forecasting will also help them meet consumer demand. On a broader level, economic forecasting is the process of making predictions about the economy as a whole. Forecasts can be carried out at a high level of aggregation — for GDP, inflation, unemployment or the fiscal deficit — or at a more disaggregated level — for specific sectors of the economy or even specific firms. Economic Impact: Studies on the economic impact of business operations should be taken into account when forecasting financial statements and business activities. For example, a mining company may take into account a study such as the one pictured here. Regression Analysis is a causal / econometric forecasting method that is widely used for prediction and forecasting improvement. Regression Analysis is a causal / econometric forecasting method. Some forecasting methods use the assumption that it is possible to identify the underlying factors that might influence the variable that is being forecast. Regression analysis includes several classical assumptions. Regression analysis includes many techniques for modeling and analyzing several variables when the focus is on the relationship between a dependent variable and one or more independent variables. A large body of techniques for carrying out regression analysis has been developed. Familiar methods, such as linear regression and ordinary least squares regression, are parametric. linear regression: In statistics, linear regression is an approach to modeling the relationship between a scalar dependent variable y and one or more explanatory variables denoted X. Ordinary least squares regression: In statistics, ordinary least squares (OLS) or linear least squares is a method for estimating the unknown parameters in a linear regression model. This method minimizes the sum of squared vertical distances between the observed responses in the dataset and the responses predicted by the linear approximation. Regression Analysis is a causal / econometric forecasting method. Some forecasting methods are based on the assumption that it is possible to identify underlying factors that might influence a variable that is being forecast. For example, including information about weather conditions might improve the ability of a model to predict umbrella sales. This is a model of seasonality that shows a regular pattern of up and down fluctuations. In addition to weather, seasonality can also result from holidays and customs such as predicting that sales in college football apparel will be higher during football season as opposed to the off season. Regression analysis includes a large group of methods that can be used to predict future values of a variable using information about other variables. These methods include both parametric (linear or non-linear) and non-parametric techniques. The sample is representative of the population for the inference prediction. The error is a random variable with a mean of zero conditional on the explanatory variables. The independent variables are measured with no error. (Note: If this is not so, modeling may be performed instead, using errors-in-variables model techniques). The predictors are linearly independent, i.e. it is not possible to express any predictor as a linear combination of the others. The errors are uncorrelated, that is, the variance – co-variance matrix of the errors is diagonal, and each non-zero element is the variance of the error. The variance of the error is constant across observations (homoscedasticity). (Note: If not, weighted least squares or other methods might instead be used). In statistics, regression analysis includes many techniques for modeling and analyzing several variables, when the focus is on the relationship between a dependent variable and one or more independent variables. More specifically, regression analysis helps one understand how the typical value of the dependent variable changes when any one of the independent variables is varied, while the other independent variables are held fixed. Regression analysis: Regression analysis shows the relationship between a dependent variable and one or more independent variables. Most commonly, regression analysis estimates the conditional expectation of the dependent variable given the independent variables — that is, the average value of the dependent variable when the independent variables are fixed. 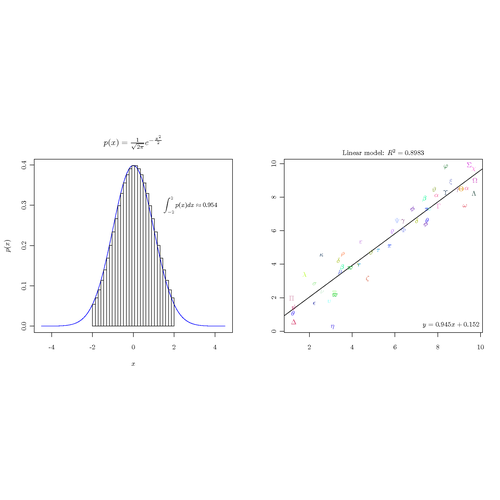 Less commonly, the focus is on a quantile, or other location parameter of the conditional distribution of the dependent variable given the independent variables. In all cases, the estimation target is a function of the independent variables called the regression function. In regression analysis, it is also of interest to characterize the variation of the dependent variable around the regression function, which can be described by a probability distribution. Regression analysis is widely used for prediction and forecasting, where its use has substantial overlap with the field of machine learning. Regression analysis is also used to understand which among the independent variables is related to the dependent variable, and to explore the forms of these relationships. In restricted circumstances, regression analysis can be used to infer causal relationships between the independent and dependent variables. However, this can lead to illusions or false relationships, so caution is advisable. A large body of techniques for carrying out regression analysis has been developed. Familiar methods, such as linear regression and ordinary least squares regression, are parametric, in that the regression function is defined in terms of a finite number of unknown parameters that are estimated from the data. Nonparametric regression refers to techniques that allow the regression function to lie in a specified set of functions, which may be infinite-dimensional. The performance of regression analysis methods in practice depends on the form of the data generating process and how it relates to the regression approach being used. Since the true form of the data-generating process is generally not known, regression analysis often depends to some extent on making assumptions about this process. These assumptions are sometimes testable if a large amount of data is available. Regression models for prediction are often useful even when the assumptions are moderately violated, although they may not perform optimally. However, in many applications, especially with small effects or questions of causality based on observational data, regression methods give misleading results. Modifying inputs such as accounts receivable, inventory, and accounts payable will significantly influence forecasting and business operations. Accounts receivable has a great effect on a firm’s expected cash inflows, and thus modifying this input on a forecast will affect how much cash a company decides to have on hand. Because of its prevalence as an expense, modifying the amount of inventory will have far reaching consequences on all forecasted financial statements. Accounts payable will influence the current liabilities of a business; therefore, its modification will change a company’s perspective on the amount of cash-on-hand needed. solvency: The state of having enough funds or liquid assets to pay all of one’s debts; the state of being solvent. The inputs of accounts receivable, inventory, accounts payable, and other line items on financial statements provide important data for financial forecasting. Modifying any one of these inputs can lead to major changes in forecasts. Similarly, drastic differences in expected values and actual values in regard to these inputs can cause problems for a company, possibly even leading to insolvency. Accounts receivable is money owed to a business by its customers and shown on its balance sheet as an asset. It is one of a series of accounting transactions dealing with the billing of a customer for goods and services that the customer has ordered. A business must not only anticipate the level of sales that will be made on credit, but it must also anticipate when payment on these accounts will occur and account for the fact that some of these credit accounts will default. Accounts receivable has a great effect on a firm’s expected cash inflows, and thus modifying this input on a forecast will affect how much cash a company decides to have on hand. Inventory management is primarily about specifying the scope and percentage of stocked goods. It is required at different locations within a facility or within many locations of a supply network to precede the regular and planned course of production and stock of materials. The scope of inventory management concerns the fine lines between replenishment lead time, carrying costs of inventory, asset management, inventory forecasting, inventory valuation, inventory visibility, future inventory price forecasting, physical inventory, available physical space for inventory, quality management, replenishment, returns and defective goods, and demand forecasting. Balancing these competing requirements leads to optimal inventory levels, which is an on-going process as the business needs shift and react to the wider environment. Companies that rely on the sale of physical goods — i.e., those that must carry inventory — must manage inventory in such as way as to decrease expenses as much as possible. Since inventory is such a prevalent expense, accurate forecasting is of the utmost importance. Moreover, the modification of this particular input will have expansive effects on all of the financial statements a firm must forecast. Accounts payable is money owed by a business to its suppliers and is shown on its balance sheet as a liability. Commonly, a supplier will ship a product, issue an invoice, and collect payment later, which describes a cash conversion cycle. This is the period of time during which the supplier has already paid for raw materials but hasn’t been paid in return by the final customer. Accounts payable will influence the current liabilities of a business, which will accordingly influence the liquidity of the business. A major requirement for a business to continue its operations is for that business to maintain solvency. Modifying accounts payable will drastically change the amount of cash-on-hand required for a business.